Brijmohal Lall Munjal-led $5B Hero Group popularly known for its two-wheeler division of Hero MotoCorp, has decided to enter the booming electronics business in India by forming a new company as Hero Electronix. As its first move into the electronics industry, the company has acquire a majority stake in the popular set top box manufacturer- Mybox which makes set top boxes for various DTH operators in the country. “Mybox is a leading supplier to marquee DTH and cable operators across India. A company with strong research and development capabilities, Mybox is a venture recognized by the Government of India and approved by DSIR (Department of Scientific and Industrial Research). It is also one of the very few companies engaged in end-to-end design of indigenous set top boxes,” said the company in its press release. Hero Electronix will see the investment of Rs. 500 crores from its parent company in the next few years. This investment will align with the ‘Make In India’ initiative of the Indian Government and hence will help in the further growth of this sector. Suman Kant Munjal would be the head of this new Hero venture and said that Hero Electronix would add more associated businesses to its portfolio over the coming years. This venture will not only make India flourish in the electronics sector but will help it in the Make In India initiative. According to the estimates of India Electronic and Semiconductor Association (IESA), the country imports about 65% of its overall demand of electronics. India’s electronic import also grew by 14.85% from $32.38b to $37.19b in 2014-15. The imports in the electronics sector also amount to about 8% of the country’s total imports. Hero Group is famous for its reliable and good quality two-wheelers made by its motor cycle and scooter division. And as we mentioned above, the electronics sector in the country is growing at a very rapid rate. It also amounts for a significant portion of total imports of the country. 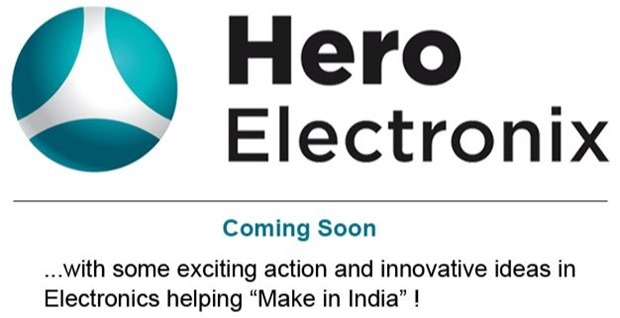 So, if Hero Electronix gets the right formula for the Indian market then it will surely touch new heights.